Let me first say that I always admire your passion and insight into gentlemen’s garments. I am a fan of Permanent Style and I have been hooked on it for years. I have one long-standing question: what kind of wallet should I carry with my suit? Which do you think is better – having a card case and bill case separately or a card-and-bill case combined? Of course, there are some alternatives like money clips. And then, which pocket to store it in? I know that some tailors close suit pockets up for two reasons – to prevent wearers from putting items in and then to prevent the suit from being out of shape because of the first reason. These questions might sound rather trivial but I would be grateful if you could share your ideas about them with me. The key to carrying any kind of wallet is to keep it as slim as possible, so be very restrictive with what you carry you with you – the minimum number of cards, only the most recent receipts etc. I find the best style is then a long wallet, sometimes called a coat or jacket wallet. 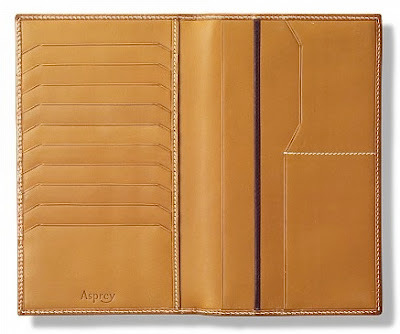 It minimises the amount of overlap of your cards, so the wallet is as thin as possible (see picture above). If you restrict yourself to four or five cards, you can even just use every other slot. The other side of the wallet carries your bills and receipts. I know people have to carry far more notes in other countries than in the UK (we get stuck with coins), but they shouldn’t thicken that other side too much. Ideally, your wallet should still not be in your jacket pocket. It should be in a briefcase or whatever bag you carry with you. Certainly that’s where chunkier items like your keys should go, and you should avoid it altogether with lightweight suits. But if it does have to go in your jacket, put it in the in-breast pocket and balance the other side with something – I have an iPhone 5, and that’s light and thin enough to work. (It wasn’t really excuse enough to upgrade from the iPhone 4, but then I like gadgets.) Keep your jacket done up too – that helps a lot with supporting the jacket and its contents. It is also helpful if your tailor cuts the in-breast pocket slightly higher than in a normal, off-the-peg suit. It means that the wallet will slightly fill out your chest, rather than your chest and waist. Of all the tailors I’ve tried, only Anderson & Sheppard and those that trained at A&S do this as standard. Perhaps it’s having that bit of drape to play with. I hope that’s helpful. 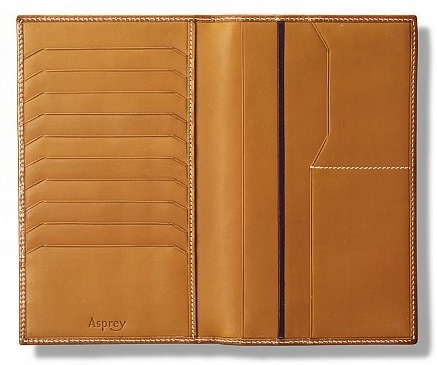 The image at top is an Asprey coat wallet. You can follow the discussion on Wallets: reader question by entering your email address in the box below. You will then receive an email every time a new comment is added. These will also contain a link to a page where you can stop the alerts, and remove all of your related data from the site. It depends on the occasion. If the drape aspect *is* critical – which it isn’t on an everyday basis – I only bring my driving licence (=ID), Visa card and one or two banknotes. Simon I too am a fan of your blog. This post was one of the most useful I’ve read in a while. I’ve long used a coat wallet in the manner you suggest and offer another reason for keeping things to a minimum – if you happen to lose it – the fewer things you need to cancel! As my wife said to me 10 years ago “do you really need to carry every card with you?” Great blog and happy New Years! Good advice. I try and carry everything in my briefcase now and it works well. You just have to train yourself to put things in there instead of stuffing them in the nearest pocket. I remember a few years ago, you did a post on the Alfred Dunhill pochette. I’ve toyed with the idea of getting one as it really fits the bill(intended), but I just can’t seem to overcome the self conciousness of carrying it, lovely as it looks. It’s strange how the mind functions, I started wearing bow ties occasionally to work a few years ago. On the first day it drew a lot of comments, but I carried on doing it and by about the third or fourth time I didn’t even give it a second thought. Mentally, there seems to be a lot more resistence to the pochette. Do you still use yours? I would go with Ettinger, either coat or billfold. Quite simply, the best bridle hide leather wallets around, bar none. There isn't that much to separate quality wallets. Most use similar leathers within their type – so all bridle hide leathers are pretty much the same and any cordovan will come from Horween and be pretty much the same. The only other differentiator is sewing my hand or machine. Ettinger and others are by machine, whereas those closer to $1000 or more, including Berluti, Hermes or similar, and hand sewn. Dear Simon, are you sure Valextra is sewn by hand? What about Equus? Aren’t his wallets hand sewn? Yes, they are very good value. I’m considering one of his “Minimal” card holders. These are made of Chevre. Any thoughts on how this compares to calfskin or bridle? Sounds like the value then is in the craftsmanship while the material is perhaps not as fine as what you might find with some machine sewn wallets. I enjoy your blog and read it daily. I had this same issue years back and changed to a money clip and card holder. But then reduced to essentials with just the money clip and a couple of cards. I have got use to using what I have and have had no problems since. I also balance out with phone. I stopped using wallets a while ago. My bespoke trousers have outward angled inner pockets inside the front pockets. 2-3 credit cards and ID go in the left inner pocket. Mobile phone in the right inner pocket. Neatly folded cash goes in the jacket inner breast pocket. Sounds like a good compromise, though I’m not sure I would carry a phone in my trouser pocket, even in the inner pocket for change that mine have. Wallet in briefcase or bag? So now I’m supposed to carry a briefcase or bag wherever I go? That’s ridiculous. What is the point of tailors giving a jacket 3 or more inside pockets as standard if you’re supposed to keep everything in your bag? I keep my wallet in my left inside pocket. My tailor knows that’s where I keep it, he knows how big it is, and he cuts the jacket accordingly. He cuts another pocket for my phone on the other side. In my trouser pocket, there is room for my keys. And that way my hands are free and I don’t need to worry about losing my handbag. What about coins gentlemen? Where do you keep these? Trouser pockets? I would imagine most bespoke suits from Savile Row would have higher in-breast pockets. Richard James definitely does and I would highly recommend them. Talking about chunkier items, and keeping in mind that it close to impossible to carry a briefcase all the time, what do you do with them? Particularly keys which can damage the pockets? Would you recommend a small leather key pouch (and where from)? Interestingly, only A&S have higher in-breast pockets in my experience. Poole, Huntsman, Norton, Richard Anderson etc don’t. I tend to always carry something – a small bag or a case or something, when I have bulkier items. Phones are generally slim enough not to bulge in a suit pocket. But for a wallet, I just tuck it into my waistband. It is far more comfortable than pockets, and just the top of the wallet showing at the top of your trousers looks far nicer than “the bulge”. Personally, I use a folding wallet, and put only one half in my waistband, so it is half the thickness again and even more comfortable. I ensure the side with coins and bulk is on the side that is out of my pants. Do you have a favorite long wallet? I have never owned that style. I actually haven’t even been the one to purchase my last few. I received a very nice wallet with a money clip for Christmas. It is thin enough that as long as I don’t overstuff it, it doesn’t seem to add much bulk. Simon, is it possible to finde Serge Amuroso’s products anywhere online? If not, what would you recommend as the best possible alligator card case? Thanks! No, they are all made to commission, bespoke. Thanks! I´m in the US and Dunhill´s leather range here is extremely reduced and does not include the hand swen, UK-made goods. Between Equus, Jean Rousseau and Chester Mox for a hand sewn, alligator card case which would you prefer? What about when you go out in casual wear like jeans and no jacket? I use a slim wallet with a minimum of cards. It doesn’t distort my jackets and can fit in a jeans pocket. I only need a single wallet and want it to be versatile. Does you long wallet work with jeans Simon? Do you ever carry a wallet in one of your rear pants pockets? Why wouldn’t you carry a phone in your pants pockets? And if you have a cigar case, where would you put it? Do you use your jacket’s pockets at all? Because it ruins the line and look of them. I only use jacket pockets for a slim wallet and a phone. Do you then have to carry a bag all the time? Do you put your keys in a bag too? Simon, when you write putting your phone in your trouser pocket “ruins the line”, do you mean it permanently damages it or it simply doesn’t look good? Have you come across a company called Pickett? If so, have you any experience of them? Thanks. Any idea if they’re at the same level as Aspinall? Curious to know if you have seen George Cleverley’s Russian leather card cases/wallets? If yes, what do you think of them? Thanks in advance.